The first in the highly acclaimed series of three rhythm guitar books, this book is designed especially to accompany the Rhythm Guitar Playing section of the LCME Electric Guitar examinations. Book One covers the preliminary grade through to Grade 2. 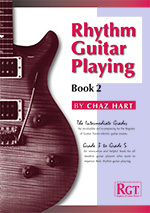 Whether or not you are taking an RGT exam this book serves as an invaluable guide in playing rhythm Guitar for the early stages player.The book includes 30 examples of the type of chord charts that will appear in the examinations, as well as providing tips and advice on how to gain those elusive extra marks, general tips on playing rhythm Guitar and detailed explanations on reading chord charts. The books are thoroughly recommended for anyone considering taking an examination, but will also prove an excellent beginning to all Guitar players who want to learn solid and fluent rhythm playing. The second in the highly acclaimed series of three rhythm guitar books, this book is designed especially to accompany the Rhythm Guitar Playing section of the LCME Electric Guitar examinations. Book Two covers Grades 3 to 5. An innovative and helpful book for all modern guitar players who want to improve their rhythm guitar playing. The final ebook in this series. Book Three covers Grades 6 to 8.